Toronto: Kids Can Press, Ltd., 1997. 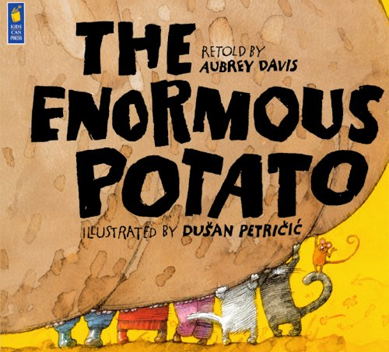 The Enormous Potato begins with a farmer who plants an eye—a potato eye. It grows and grows into an enormous potato. Harvest time comes, but the potato is so big that the farmer can’t pull it out. So he calls for help, first to his wife, then to their daughter, then to the dog and so on. Energetic illustrations capture the growing determination of the family to free the potato from the soil, and the celebratory feast that follows their success.